Price: High (but for the quality it is a good value for money). 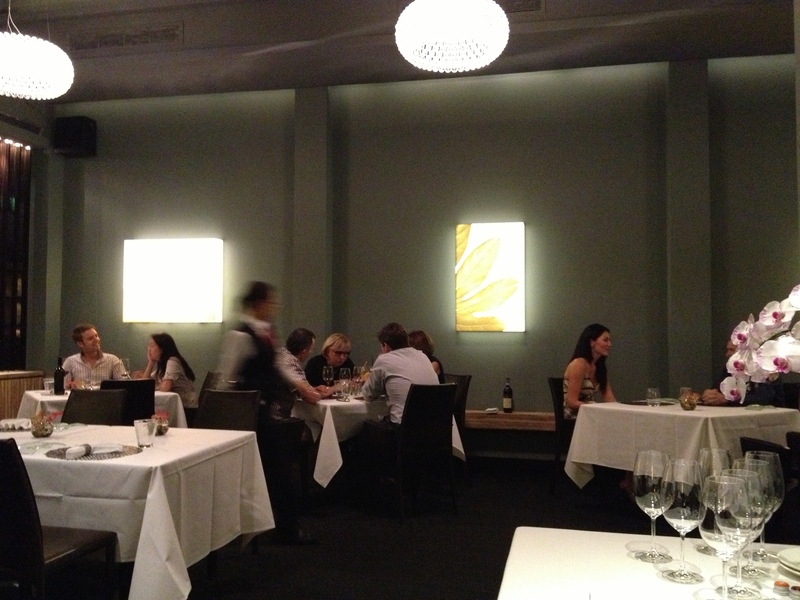 Atmosphere: It feels much more informal than at most of Michelin stared restaurants. Colourful walls, very friendly and upbeat staff including its owner Umberto and the dress code is also much more relaxed. 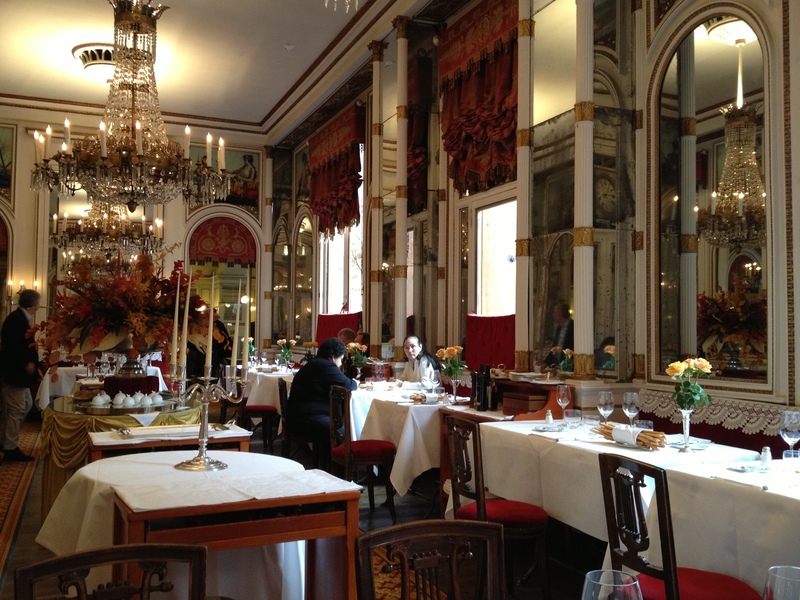 The tables are elegant yet cosy and Umberto makes everyone feel like at home. I would call his approach a grandmother’s style – serving you generous portions and adding more and more tasty dishes than you would imagine ordering. But they are so good and he knows what is best on that day so trust him and forget about a light meal. Food: Hearty, generous and superb quality of ingredients. We came still in truffle season so everything one can imagine was or could be enhanced by tremendous truffles from Alba. Impolitely staring at other diners’ plates I spotted amazingly looking Beef tartare served with white truffles, so I had to try it. The starter had not disappointed. 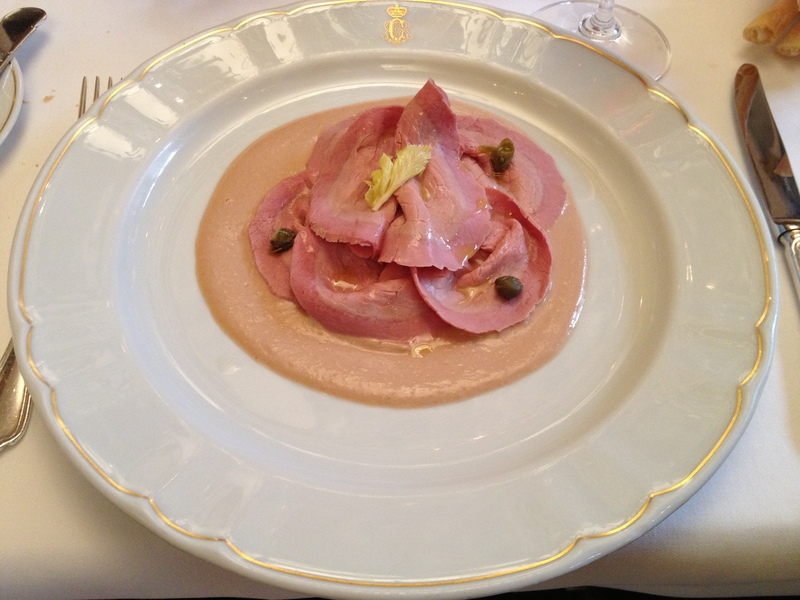 I have never had before (yet two courses later it was repeated) such a generous hat of truffles on any dish. Even a thought back about this dish makes me salivating! My friends from Turin are regulars at Vintage 1997 so I listened not only to Umberto’s suggestions but also to theirs. Their choice of a crispy Artichoke with egg and melting parmesan was exquisite. Again not a very light dish, but full of flavours and calling for some wine to lighten it up a bit. The home-made pasta here are like from a grandmother – no eggs were spared. The Agnolotti egg pasta are one of the restaurant’s signature dishes. I got them simple with butter sauce and another generous shaving of white truffles. If one is very hungry this plate will satisfy immediately, but it can be a shock for some cholesterol-minding customers. From the desserts the homemade Tiramisu is perhaps the most popular but the chocolate aficionados also find plenty of sweets prepared with chocolate. Turin is famous for high-quality chocolate and the tradition spans across centuries, so you much give it a try. Drinks: The wine list is spectacular with high- as well as low-priced Italian wines, but also some French treasures. What I appreciated was that Umberto selected to me a lesser known wine for a very reasonable price which tasted marvellous! What more to wish for a serious and even a less serious but price-conscious wine drinker. A bottle of a red Merlot from La Morra Langhe DOC 2006 made without any chemical fertilisers and from low-yielding vines by Fontanazza-Pissotta was surprisingly fresh and deep for a Merlot. Not a very Italian grape, but this wine proved that Merlot can thrive in Northern Italy. Opening hours: Lunch: 12:30-14:30; Dinner: 20:00-23:00; closed for lunch on Saturday and on Sunday. Address: Piazza Solferino 16h, 10121 Torino, Italy. Price: High (starters about 25 SGD; mains around 50 SGD). Garibaldi is a fine dining restaurant serving a genuine Italian food in Singapore. The gargantuan distance from Italy does not stop the local chefs from importing desirable and genuine products from Europe. Singapore is one of the busiest ports in the world and cultural melting pot, where everything is possible. If you are willing to pay extra, you will get the freshest burratta, parma ham or mascarpone whenever you please. You can expect all these delicacies in top shape at Garibaldi. Atmosphere: Large rooms are not intimate, but they offer a sense of sufficient privacy with the tables being kept at a good distance from each other as well as a number of large tables inset along the wall. It is a fine dining restaurant so smart casual attire is required. Chef: The Italian-born Roberto Galetti has made Singapore his home after opening his own restaurant Garibaldi in 2003. Since then he won multiple awards for his culinary skills including Garibaldi being voted the 7th best restaurant in Asia according to the Miele Guide. Food: Authentic, large portions and high taste profile. You can select from either an à la carte or a gourmet 6-7 course menu. From the later the CAPELLI D`ANGELO FREDDI CON OSTRICHE E CAVIALE KRISTAL – Cold Angel`s Hair pasta with Fresh Oyster & Kristal Caviar are very popular. The starters à la carte are the typical Italian antipasti that one would expect, yet they are excellent. Go for the PARMIGIANA DI MELANZANE – Neapolitan Style Baked Eggplants with Mozzarella, Basil & Tomato Sauce if you want a warm and filling starter with a glass of oaky Chardonnay. In the mood for something meaty? 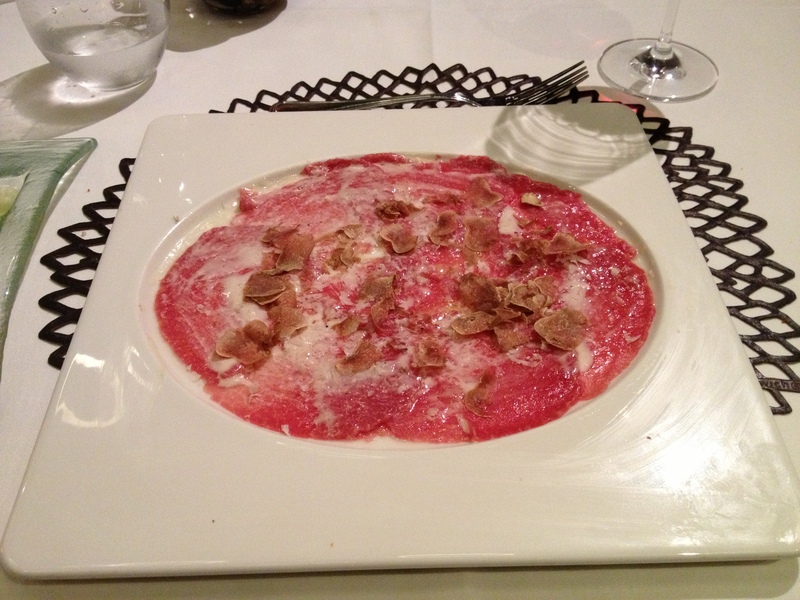 Then the CARPACCIO DI MANZO ‘WAGYU’ BLACKMORE – Blackmore Wagyu Beef Carpaccio, Parmesan Cheese with Rocket Salad would be my recommendation. During a truffle season (September-November) they serve it with shavings of these superb fungi on top instead of the rocket. Another classic is MOZZARELLA DI BUFALA – Buffalo Milk Mozzarella with Italian San Marzano Tomatoes & Basil, that is as creamy and delicate here as at a farm in Italy (I have been to one so I know what I am saying) served with lush and juicy tomatoes. Moving to main courses you can go Italian with a plate of pasta before a meat dish or save some space for a desert and go straight to the secondi. A Milanese classic in the ‘schnitzel’ style – CLASSICA COSTOLETTA ALLA MILANESE ‘ORECCHIA D’ELEFANTE’ satisfies large plate lovers with affection to meat. 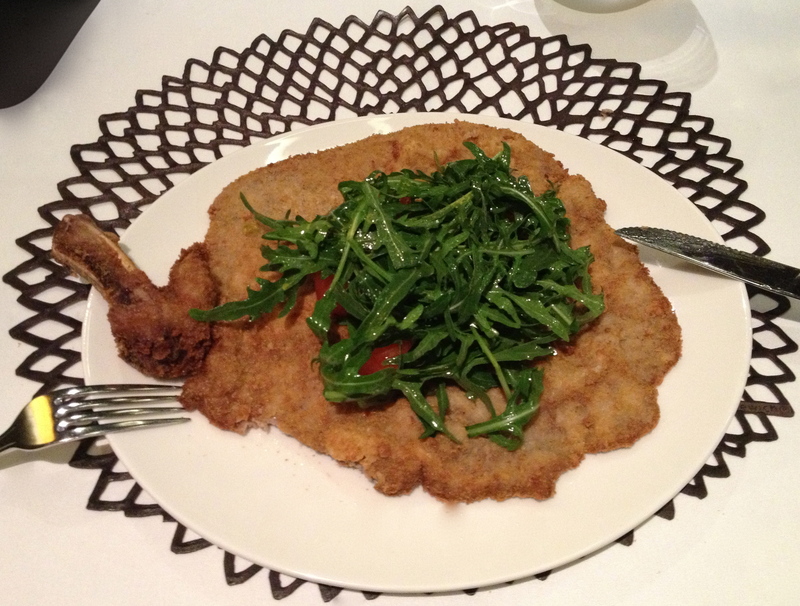 The crispy thin breaded veal chop is mellow as well as tasty and traditionally served with tomatoes and rocket salad . Fish is also done well at Garibaldi. I’ve tried the MERLUZZO IN GUAZZETTO DI LEGUMI – Oven Baked Brittany Cod with Baby Spinach & Mixed Beans ‘Guazzetto’ and liked it almost as much as a fish served on the Mediterranean coast of Italy. If you still have a room for desserts then you can choose from the Italian sweet classics such as Pannacotta, Tiramisu, Sicilian Canollo or Marsala Zabaione. The ‘chocoholics’ will indulge in TORTINO CALDO AL CIOCCOLATO – Molten Lava Chocolate Cake with Hazelnut Gelato & Raspberry Coulis. 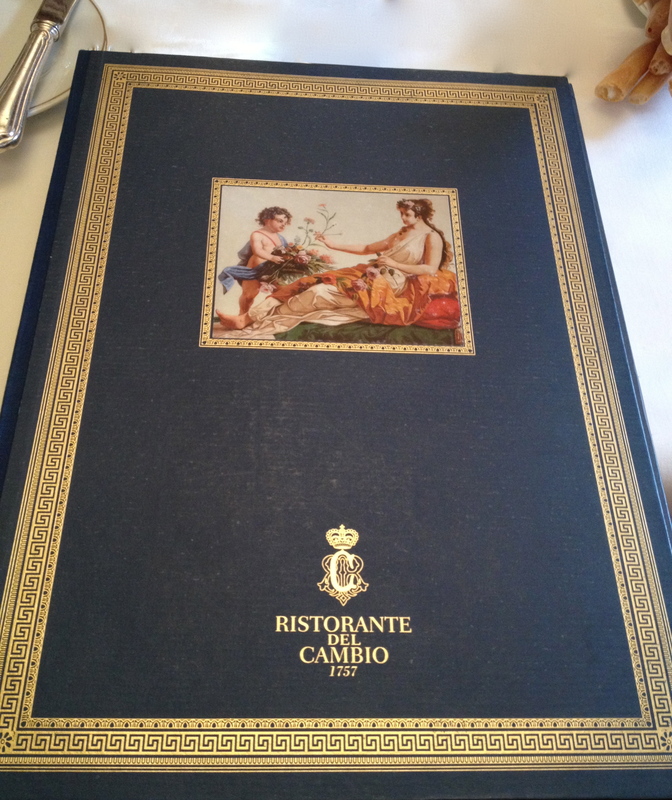 Drinks: the wine list is spectacular and very good in Italian wine selection. We started with a lesser known white Chardonnay from Valle d’Aosta region that the sommelier recommended and like it a lot. It had some oak on the palate, but overall was pretty balanced. Since each of us had a different main course we had to compromise in terms of red wine. Not going too heavy for fish and not being too light for the meat dishes. Barbaresco from Piedmont was a calling from heaven that fit our demanding requirements perfectly. 2006 vintage had settled down tannins and it was not too fruity either. Long finish assured a memorable wine and food pairing dinner.